In my previous post, I talked about wearable technology, and the way that, for communications at least, the day is not far off when you won't need to wear or carry your 'phone around with you - but you won't need an implant or circuitry embedded under your skin either - you can be completely naked and still access your contacts, make a call, and all with nothing more than voice and gestures. ​And I've had some feedback on that post that suggested I may have been getting just a little ahead of myself - or at the very least, ahead of you. In my picture, Mike is supposed to look really excited because it's the early 1980s. 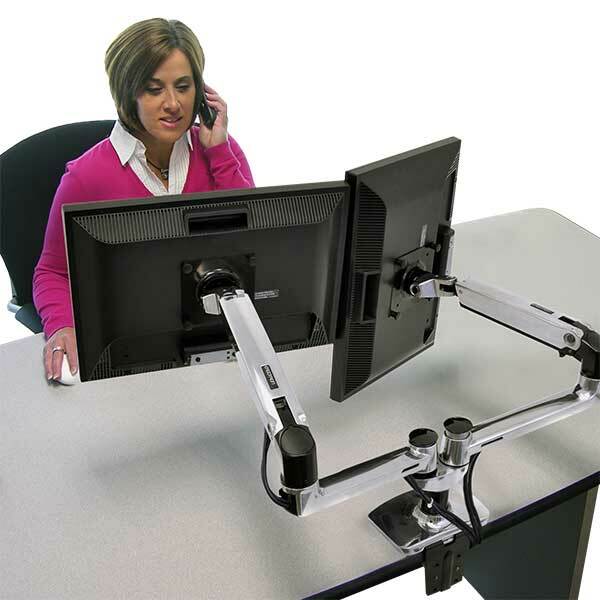 A lot of authors are still typing on desktop computers, though I'm reassured to learn that many have flat, LED screens now, and some even have them mounted on a posable mount arm! Increasing numbers of authors are also writing on laptops... which speaking as an ex-IT consultant, I have to tell you is very bad, long term. If you're writing, you need to touch type, and you need to keep your head reasonably level. Laptops discourage both. You learn to touch-type much more slowly because you can see the keyboard and screen at the same time. You do your neck (and it is suggested, your eyesight) long term harm, too. All sorts of interesting interim solutions have been devised for this. I used to have my laptop on a book stand, with a USB keyboard connected to it. Technology is moving on really fast. My dual mantra, "you will have to learn, you will have to search" is especially true here. But I can tell you where this is going - I can give you a few pointers, that will be especially useful to authors, in particular those who are still hammering away at the keyboard of a desktop computer. ...and if you're busy working on both your pillars, then you also spend a fair amount of time online - working on your marketing, your social media, your advertizing, your networking, and so on. Running your own business - which, if you are a writer, is what you do - requires you to be connected whenever you need to be, which means you need a device that's both portable and powerful, so you probably have a pretty good smartphone. And for the time being, you're going to continue to need one. If you already have one you can skip straight to device #2. You will have to learn, and you will have to search, but with the information I've given you, you can get started. The way that the technology is going, if you're an author, and most of your screen time is going to be spent either writing your book or doing your promotion, marketing or communications, I strongly advise against getting a computer. A tablet and a Bluetooth keyboard. Most tablets are already more powerful than any personal computer was 10 years ago. So they combine outstanding computing power with portability. Picture quality is better than the screen you're reading this on. Anything you can do on your computer, you can do on a tablet.​ Screen size is only a small concern, because for the good of your eyesight, what matters is the quality of the picture. Of course, you'll want the screen at a healthy height for your eyes, and if you search for, and learn about tablet mounts​, you will be able to achieve this. The keyboard in the picture is Microsoft's Universal Folding Keyboard. Even if you touch type it only takes a few days to get used to the small gap in the middle; it's slim, light, very portable, and can be used with all flavors of device. Other Bluetooth keyboards are available. Many, many others. ​This happy family may now be set up anywhere temporarily using a small foldaway tablet stand, or clipped onto that tablet mount when you're in your writing nook. And because you'll now be storing all your manuscripts and notes "in the cloud" (you will have to learn, you will have to search)​, all your work will always be accessible to you wherever you go, and you'll never have to worry about breakdowns or loss or theft, because whether you store in the iCloud (Apple), on Google Drive (Google/Android) or Onedrive (Microsoft) or a third party like Dropbox, they will do all the backing up for you. ... is what I'm trying to show you; if you're thinking of getting a new computer right now, then what I've been talking about is exactly what you should be looking for, and you should not wait. The portable typewriter allowed authors to take their work anywhere. Those days have at last returned.